When spring begins, five minutes cannot pass without a tour coming into the Library; in walks a group of eager, bright faced parents, and their children, most of whom look like they would rather be anywhere else. Every once in a while it is fun to hear a tour guide rattle off incorrect information, such as “the library is open 24 hours a day.” There are students who come into the building only once in their entire college career and ask for directions to the stairs. However, there are also the usual students who come in and out several times a day and probably spend more time in the Library, whether it is for work or for play, than many of the employees do. Not only is the Library a great place to see while working at the front desk, but the Library also provides so many amazing services. Unfortunately, many students do not even know about them. For example, who knew you could rent a kindle or nook e-reader and take it home with you from the building? Or that on the second floor, there is a whole army of brilliant research librarians who can get you all the resources you need for even the longest of papers. Guest lecturers come to the Library several times a week. You not only sit and listen to what they have to say, but you almost always get cookies when they’re finished talking. You can rent computers, power cords, head phones, Ethernet cords, calculators – you name it – chances are the Library will have it. Most importantly, the Library provides an environment that can be studious but social at the same time. At the heart of Villanova, the Library manages to do it all, and without it life on campus would not be the same. Meghan Rodgers, ’13, is a political science major and Chinese minor. 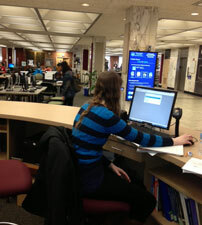 She works part-time for the Access Services team in the Library. Great job on the blog, Meghan! We will miss you!